Create a Victorian Ghost Story Atmosphere. On Christmas Eve, it is a family tradition in our house to sit around the fire and by candlelight we tell ghost stories just like the Victorians did. This is a great way to introduce children to “Christmas Carol”. 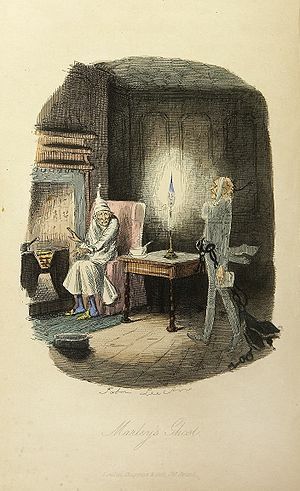 For older children read the original Charles Dicken’s “Christmas Carol” and do it in stages on the run up to Christmas. It will be something which they will look forward to particularly if you create the right atmosphere with candles, hot chocolate and marshmallows and a sense of fun thrown in. For younger children, there are some excellent versions of the story which have illustrations in and will introduce them to the basic concept of the story. The main thing is to create the atmosphere and have fun. Introduce Scrooge. I was first introduced to “Christmas Carol” by watching the old 1951 version starring Alistair Simm as Scrooge. It was Christmas Eve and the snow floated down outside as I watched it, it was an afternoon which was to mould my attitude to Christmas. If the children are older you could watch it all the way through, however, for younger ones you only need to watch the first six minutes for them to get a fascinating insight of the character of Scrooge. Tell the kids you’re going to show them a film clip of a man called Scrooge and they have to decide if he is a Christmas baddie or not. As you watch the first six minutes ask them why he is not nice and get them to boo him. It’s also great fun to shout “Baddie! Baddie! Baddie!” You can even get them to vote as to whether he is the worst Christmas baddie ever or can they think of worse ones and why are they worse than Scrooge. The important thing is to get a conversation going as to why we don’t like Scrooge and to have fun, fun fun. For older kids, ask if they think Scrooge can ever become nice and then question why they think that he can or can’t and then tell them that they need to watch the whole film to find out whether he changes or not. You can watch it here. Make your own Christmas ghosts on film. Watch Horace Gawp’s Christmas Carol below, check out our ghosts and then make your own. It is easy and great fun to do. All you have to do is get the kids to put some of their dressing up clothes on or use different clothes than they normally wear. If there are any hats or wigs in the house these can be used. Putting clothes on which are far too big or small will give a comic effect. Once the clothes are on, get the children to pretend that they are a long lost ancestor – they don’t have to exist – you can pull them out of the air for instance, you can have great uncle Theophilus Windbag. Tell the children to pretend that they have come to visit each other or you with a message for the future. When they have worked out their message, get them to act it out and film them. It doesn’t need to be very long. Upload your chip to your computer and if you have ‘windows live movie maker’ – you can use that. If you haven’t got ‘windows live movie maker’ on your computer upload your film to Youtube. (For You tube, upload your film and click on “enhancements “- you will see a menu of different colours, it is probably best to choose the lightest but play around with different ones to get the effect which you wish. Don’t forget to save your final choice.) For ‘ windows live maker’, click on that. In the top menu click on “add videos and photos” and it will ask you to choose which photo or video you wish to use. Click on the film clip you have just made. When your film pops up, look at the top menu and click on “visual effects”. You will see one which is all white, this is the one which we used for our ghosts, however – play around to see which suits you best. Once you have done this, return to the “home” menu at the top and save your film. You will be asked to give it a title and that’s it you have created your own speaking ghost. Create your own Christmas Ghost Story. Once you have gotten in the mood for Christmas ghost stories, it is a good idea for the kids to create their own. I use the term “create” as opposed to “writing” because I know that as some stage most adults are able to read and write, however, to me, it is more important to concentrate on encouraging children to think creatively. Once they are bursting with ideas then they can be recorded but the pressure to put pen to paper before the ideas have been thought often creates a creative blockage. So if you start off with a framework of a person who treats others badly at Christmas time but gets visited by three ghosts who want to show him something from his/her past, present and future, then you have got a basic plot to work from. Character wise – start off with Scrooge (or whatever you wish to call your main character) and perhaps discuss why this person treats others so badly and hates Christmas time. You will be surprised how much this gives you to put into your story. The main point here is to get the kids thinking and having fun. Let them create three ghosts, get them talking about where they want their story to be and in what time period. It is amazing how creative kids become once the pressure to sit down and write is off them – so get them shouting out their ideas, looking on the internet for what their ghosts can look like and generally having fun. It doesn’t matter if the story never gets finished because the end product is not what this exercise is about. The object of the exercise is to get the kids to know a little about Christmas Carol and Charles Dickens and most of all it is to give them the confidence to be creative. Encouraging them to be creative is one of the most important gifts you will ever give them as creative thinking is quite simply problem solving – this is needed every day of our lives and the more children do it, the better they become at it – need I say more? Playing at Christmas Carol. When I was a child we would watch a film or television programme and then we would go outside and play “Batman” or “Robin Hood”. When kids play like this, they are effectively creating drama. 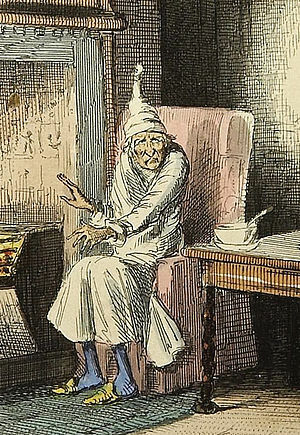 So if you’ve read them the story or watched the film, it’s a great idea to let them play some scenes from “Christmas Carol” Which child wouldn’t like to be the horrible Scrooge? They can get out all their inner niggles without getting in trouble. 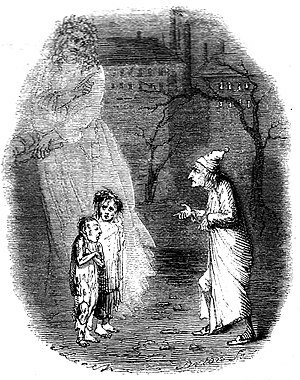 How exciting to play Marley’s Ghost with the chains and frightening the life out of that horrible Scrooge. Let them improvise with their own words and their own rendition of the story, join in with them until they get the hang of it and let them get lost in the old fashioned world of playing. Who knows, they might come up with their own shortened version which they want to put on for the family for Christmas. Children never fail to surprise me with the depths of creativity once a seed has been planted. Visit a stately home in the run up to Christmas. Hardly anybody can build up a Dickensian atmosphere like these folks. There the children will see the costumes and decorations in reality. Many places have got special events on this year which will especially demonstrate how Christmas was in Charles Dickens “Christmas Carol. The National Trust, English Heritage and Historic Houses Association are good places to begin looking. We hope these “Christmas Carol” activities have been of use to you but most of all we wish you a very Merry Christmas. Have fun.